Another name for this block? Thread: Another name for this block? A friend showed me a picture of a quilt and I think its called Indian Hatchet...however in the one she showed me there is one solid white square in the middle then on the outside the 4 white triangles match up to make another white square..the only patterns I can find show ALL the squares are made up of triangles. 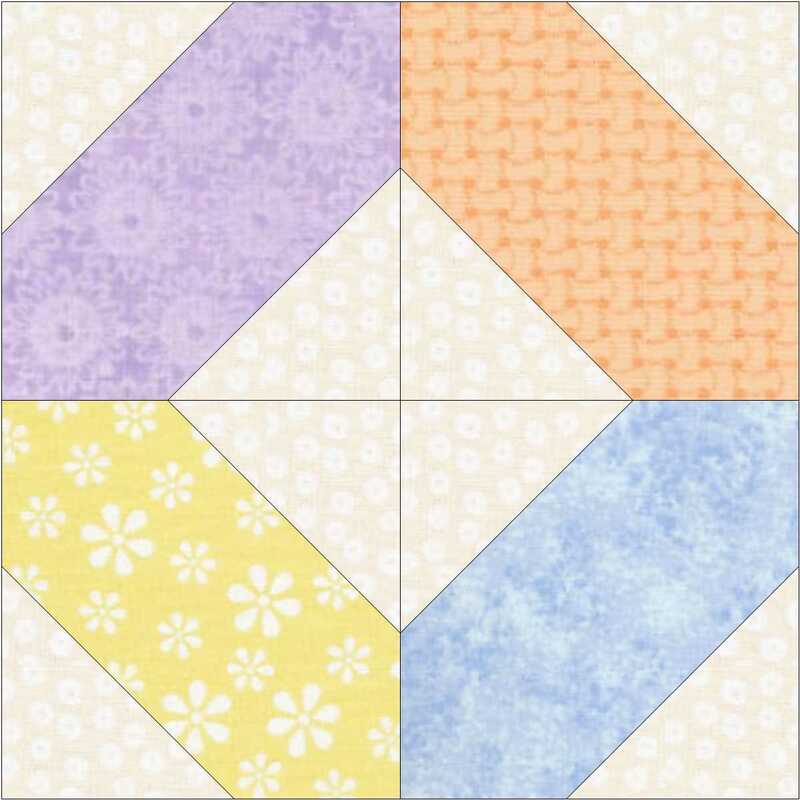 Does anyone know of a pattern where you start out with a white 3" square, put the four colors around it then put a 2 3/4 half triange on the outside of all 4 colors? Just saw this on Pinterest. QUOTE=joanelizbay;6069625]A friend showed me a picture of a quilt and I think its called Indian Hatchet...however in the one she showed me there is one solid white square in the middle then on the outside the 4 white triangles match up to make another white square..the only patterns I can find show ALL the squares are made up of triangles. 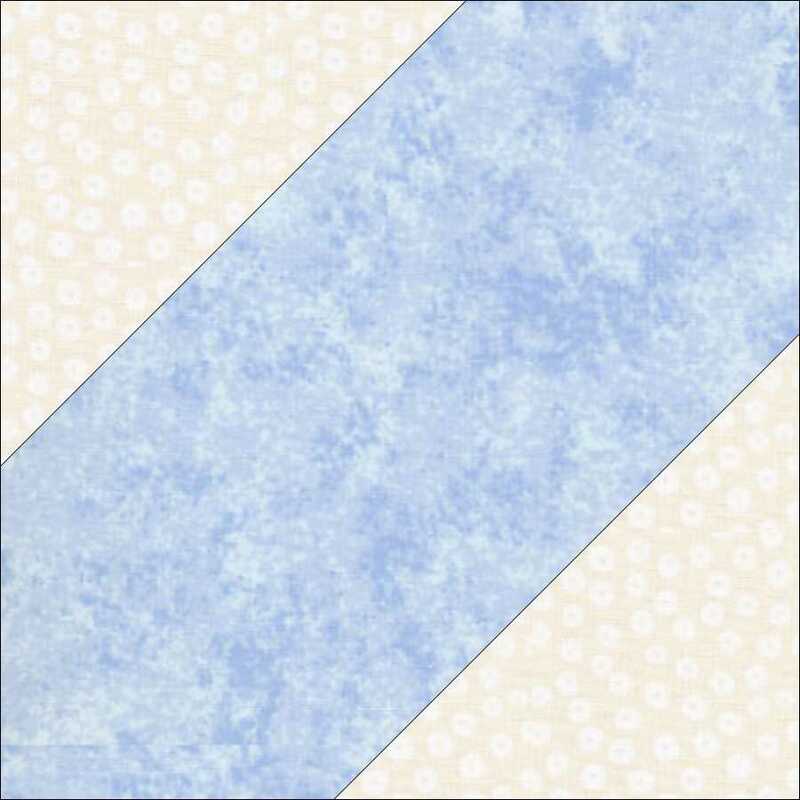 I know that new line of fabric called Rose Cottage has this pattern used for this new line of fabric by Clothworks. Pattern is available on their website. Many patterns have various names given. It does get confusing sometimes. I'm curious as to why you'd rather make the block with a solid center square? Last edited by Peckish; 05-17-2013 at 08:21 PM. Jenny does a nice version of this pattern called X and O? 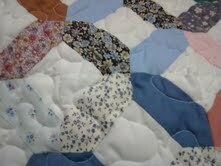 It is on the Missouri Star Quilt Co. Youtube videos. Peckish, it just lays flatter and looks more crisp I think..Im sure the 4 triangles would be easier. Thanks for ALL the tips and answers!! Peckish, where can I find this pattern? I tried to follow your link and got an invalid message. My reference (Maggie Malone's book, 5500 Quilt Block Designs) gives Road to Tennessee as the name of the design with four triangles in the center and Kansas Dugout as the name of the design with a solid square in the center and triangles where the block corners meet. Neither is subheaded as Indian Hatchets, but that's the name of the single unit that makes up the Road to Tennessee arrangement (same as the top image that Peckish posted). Kansas Dugout as shown on Quilter's Cache is not the same as what Malone has documented. I made a large throw, very scrappy, by Peckish's method, and it lies flat w/o problems. I put the corner triangles on with the sew-a-square-on-the-diagonal method, sewed two seams, and used the little leftover half-square triangles in the borders, sewn into strips. It all worked surprisingly well . I didn't post a link to a pattern, I posted pictures only. I tried to find patterns at QuiltersCache.com using the names that Ghostrider provided, but Road to Tennessee isn't listed there and as she said earlier, the Kansas Dugout is a totally different block. Sorry. I just found a block in Quilter's Cache called Arkansas Crossroads. It's the one you're looking for. It has the "hatchet" alternating with four patches, but if you replace the four patch with a solid white square, it's your block.